Through three starts, Hyun-Jin Ryu has not been good. A 5.87 ERA, a 6.95 FIP, and a 6.02 DRA are his numbers after 15-1/3 innings. It’s three starts, and normally you can’t really read too much into three starts. 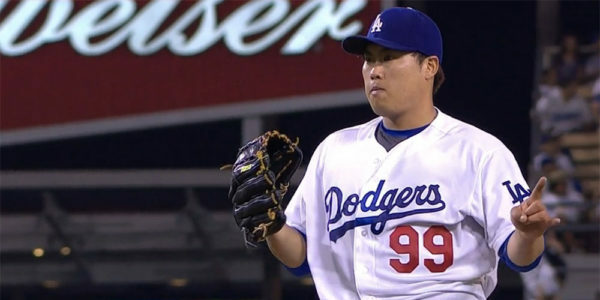 The fact that Ryu is still pitching at all is something of a medical miracle. However, given the Dodgers’ other starting options, Ryu’s leash can and should be short, especially if the problems are unlikely to go away soon. Unfortunately, those issues start with the pitch which has been the story all throughout his rehab: the fastball. Hyun-jin Ryu has thrown 126 four-seam fastballs so far this season, about 54% of his pitches. Across the three starts, the pitch has averaged 90.4, 88.5, and 89.7 mph. That’s unstable, which is interesting, and it’s also less slow than the initial rehab reports. However, the overall velocity average is still a problem, even after last night’s faster showing. It is 50th among 52 starters who have thrown at least 100 four-seamers this season, per Baseball Prospectus’ pitch leaderboards. The only pitchers lower are A.J. Griffin and Bronson Arroyo. As a result, batters are not missing that fastball. Among the 52 pitchers in that group, Ryu is 45th in overall fastball whiff rate. To give you an idea of the sample size we’re still dealing with, Clayton Kershaw is 46th. A post for another day, perhaps. That type of command just doesn’t work with one of the slowest fastballs among full-time starters. Of course, things have not been all bad for Ryu. So far he’s faced a disproportionate number of very good lineups (Rockies twice, Cubs once). The hitters who have gotten him for homers (including Arenado twice, Story, Rizzo) are mostly a selection of some of the National League’s best home run hitters. We’re also dealing with HR/FB rates (50%+) that are not sustainable by even the league’s worst pitchers. Ryu’s strikeout to walk differential is significantly higher than the NL average, and those are the numbers that are the most stable with such a small sample size. The other good news is that Ryu’s changeup has been extremely good in this limited look. Of the 20 starters to throw at least 50 changes so far this year, Ryu’s whiff/swing rate is third and his whiff/pitch rate is first. The problem is that the change needs the fastball to set it up, and reducing fastball usage to throw more changes has a “diminishing returns” aspect to it. 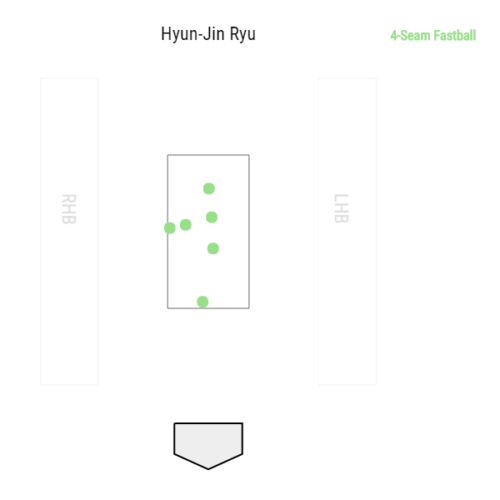 Ryu’s slider has been reasonably effective and the curve has been okay, but without a good fastball to set those pitches up there’s only so much he can do. Given that Ryu is doing something that no starter can sustain with some other positive indicators, this is normally where the “don’t freak out yet” part would go. However, Ryu’s recovery from injury is a unique circumstance, and the Dodgers have the pieces in place to replace him, if necessary. Julio Urias is probably a tune-up start or two away from being ready, and Ross Stripling is also an option in the short-term if necessary. Asking Ryu to struggle through his problems is not great for the team, and it’s probably not fair to Ryu either. An interesting option may be the bullpen, given the velocity increase that might come with the move, along with the early effectiveness of Ryu’s change. The tools are there for him to be something like Luis Avilan — okay fastball setting up a plus changeup. Avilan has made it work throwing the two pitches almost 50/50, which is something Ryu could consider in shorter outings but would not work in a start. That’s more of a platoon-neutral package than a LOOGY, but that’s still potentially useful to have. Of course, that would be an adjustment for Ryu that may work better in theory than in practice. Ryu had a few outings in relief when he was dealing with his initial shoulder injury in Korea, but that was six years ago and not often enough to know if he was any good at it. Ryu may or may not want to go down that road, which could also cause problems. Overall, it’s unwise to ignore this issue as just being a weird small sample thing. Ryu has already allowed two fewer homers than he did in all of 2014, and he’s done it on a pitch that he realistically can’t reduce usage on more than he already has. There are enough positive indicators behind his performance that he doesn’t need to be removed from the rotation immediately, but it is certainly possible that his time is growing short. 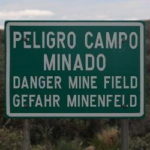 Another bad start or two and it may be time to start looking at other options.